WASHINGTON (June 28, 2018) — Nearly one-fifth of Realtors® practicing in commercial real estate closed a sale with an international client in 2017, and 35 percent said they have experienced an increase in the number of international clients in the past five years, according to a report from the National Association of Realtors®. NAR’s 2018 Commercial Real Estate International Business Trends report analyzed cross-border commercial real estate transactions made by Realtors® during 2017. The study found that most Realtors® who specialize in commercial real estate reside in smaller commercial markets where the typical deal is less than $2.5 million. “The profile of smaller commercial markets is continuing to rise as many foreign investors are attracted to smaller-sized properties in secondary and tertiary markets, bringing Realtors® confidence that increased sales and leasing activity will continue to occur in 2018,” said Lawrence Yun, NAR chief economist. “Since 2016, world economies have regained their footing and have pressed toward higher ground. Global economic output increased in 2017, and commercial real estate continues to be a healthy investment for global investors,” Yun added. See and share an infographic containing data from the report. Of the 59 percent of Realtors® who indicated they completed a commercial real estate transaction last year (69 percent in 2016), 18 percent reported closing a deal for an international client (20 percent in 2016). Among survey respondents who closed an international transaction, 46 percent closed a buyer-side transaction, 13 percent a seller-side transaction and the remainder closed both types of transactions. 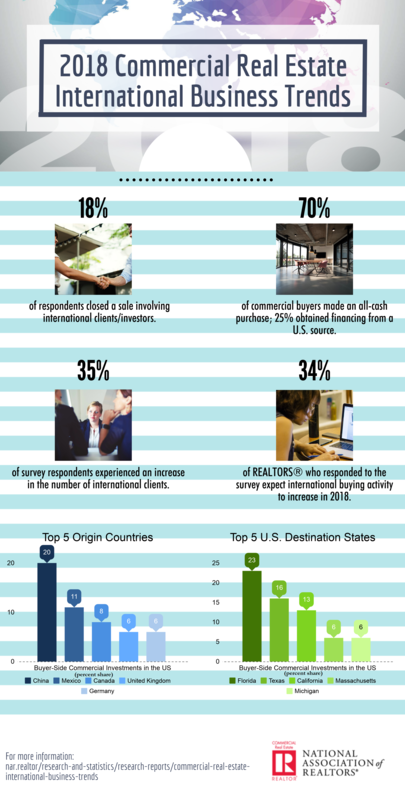 Over 60 percent of buyer-side sales were transactions with foreign buyers who primarily reside abroad. Most seller-side transactions (57 percent) were of properties sold by clients who were temporarily residing in the U.S. on non-immigrant visas. Nineteen percent of Realtors® said they completed a lease agreement on behalf of a foreign client, down from 22 percent in 2016. The median gross lease value for international lease transactions was $200,000 ($105,000 in 2016) with most space typically under 2,500 square feet. The top countries of origin for buyers were China (20 percent), Mexico (11 percent), Canada (8 percent) and the United Kingdom (6 percent). While sellers were typically from Mexico (20 percent), China (15 percent), and Brazil and Israel (both at 10 percent). Florida and Texas were the top two states where foreigners purchased and sold commercial property last year, with California being the third most popular buyer and seller destination. International commercial buyer and seller transactions typically tend to be at the higher end of the market. Last year, the median international buyer-side transaction was $975,000 and a median seller-side transaction was $1 million, while the median commercial transaction was $625,000. “Realtors®’ international clients found U.S. commercial real estate markets to be a good value in 2017. About seven in 10 respondents reported that international clients view U.S. prices to be about the same or less expensive than prices in their home country,” Yun stated. The survey also found that foreign buyers of commercial property typically bring more cash to the table than those purchasing residential real estate. Seventy percent of international transactions were closed with cash, while NAR's 2017 residential survey found that half of buyers paid in cash. For those not using all cash, 25 percent of commercial deals involved debt financing from U.S. sources. A majority of buyers purchased commercial space for rental property (39 percent) or for business investment purposes (34 percent). NAR’s commercial community includes commercial members, real estate boards, committees, advisory boards and forums; and NAR commercial affiliate organizations – CCIM Institute, Institute of Real Estate Management, Realtors® Land Institute, Society of Industrial and Office Realtors®, and Counselors of Real Estate.